I came across this great blog wrote by a young man called by Rhys Davies, I contacted the young Welshman to post a guest blog about life in Bangkok, Rhys duly obliged and below is his article for sweet3mango. Before I moved to Bangkok sometime last year, I did my due diligence. I did as much research as I could about the culture, the cost of living, and even picked up some basic Thai phrases so I wouldn’t look like a complete buffoon once I left the airport. However, when I eventually landed and got to know the way of life here, I was shocked that so much information online was inaccurate. It’s like people are so scared of offending anyone by saying something like “Bangkok is expensive” that they will spin the truth and outright lie to you. Since arriving, I have been hit by surprise after surprise and it still has yet to stop. Bangkok is a fascinating place when it wants to be, but that doesn’t mean it won’t find ways to frustrate you too. About what you need for one day in Bangkok if you take this article too literally. Expectation: A cheap place to live. Reality: Often more expensive than my home country. I’m sure if we were comparing Bangkok to London, the cost of living wouldn’t be worth talking about. But most of us aren’t from London, Berlin, or Paris. Most of us are from regular, less wealthy areas of our respective countries. Let’s also bare in mind the average salary (≈฿25,000) as we jump in here. The BTS can cost up to ฿59 per journey, making your monthly commute over ฿2000. One of your first encounters with money when you get here will be the taxis, buses or the BTS (skytrain), and to be honest with you, this is a cheaper area of life, although due to the sheer size of the city you do have to rely on transport. Americans may have never heard of walking to work, but if this is the norm for you it could take you the better part of the day in Bangkok and you’ll stink, get heatstroke, or both. Beer advertising relies on suggestion and word of mouth. Not a joke, just a fact for you. Then you’ll probably go to a restaurant of some description and be pretty happy with the cost of eating out here. Why not get a beer with it? Oh, that costs more than your meal? Get used to it. 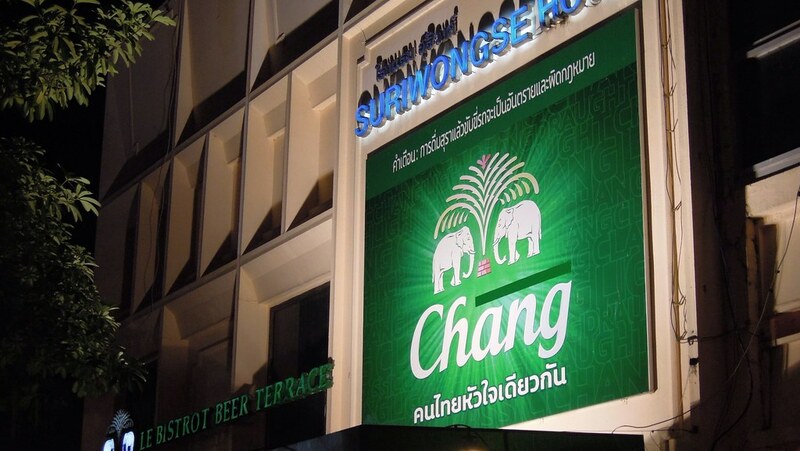 A beer in Bangkok will likely cost you over ฿100 for a bottle, or if you’re lucky, draft. Even if you get it from a supermarket, it’s still going to be over ฿50. If you aren’t a heavy drinker, great, you won’t have to experience this. But if you are, you should probably pick up smoking too to even out the price. Obviously, do not pick up smoking. Watch out for the farang tax. Speaking of the supermarket, do you know how much your weekly shop will cost? You could be looking at ฿2000, not even including any Western products or alcohol you might buy. ‘How can this be possible?’ you think. Well, most Thais get their groceries at the market. Won’t help you, though, because you’re not Thai (probably). You’ll be getting the extra ‘farang tax’ on top. So prepare to get ripped off something awful at first. Once your Thai improves, then you can settle into only being ripped off a little bit. If we want to be pedantic, water costs more too. If your condo doesn’t offer free water, then you’re likely to spend at least ฿2000 a month there, if you’re healthy. Probably an average condo for one person. See how I slipped the word condo in there? That’s how we’re going to transition into this next paragraph. Rent can be cheap here, but you really do get what you pay for. I live in a 25m2 studio apartment towards the edge of Bangkok with my girlfriend. The walls are made of glass but it’s modern, it has a kitchen, we have security and a few other nice features. But the same price would get me something double the size back in the UK. It could even get you a three bedroom house in Thailand if you’re willing to leave the city. Remember to also shave your face if you want to be taken seriously here. Let’s also give an honourable mention to haircuts. They’re hit and miss. I’ve paid more here but I’ve heard rumours of cheaper places. How much do you pay? Bangkok is not a great place to take advantage of low prices. In fact, it’s the second most expensive city in ASEAN. A local farang salary can be enough to support you, but don’t expect to make any kind of savings without working yourself to death. If you do want to do more with your money, head elsewhere in the country. Bangkok isn’t Thailand. If you liked this article, why not consider discovering more like it on my website, or by following Get Lost Guide on social media?